Ammon Shea recently spent a year of his life reading the OED from start to finish. Over the next few months he will be posting weekly blogs about the insights, gems, and thoughts on language that came from this experience. 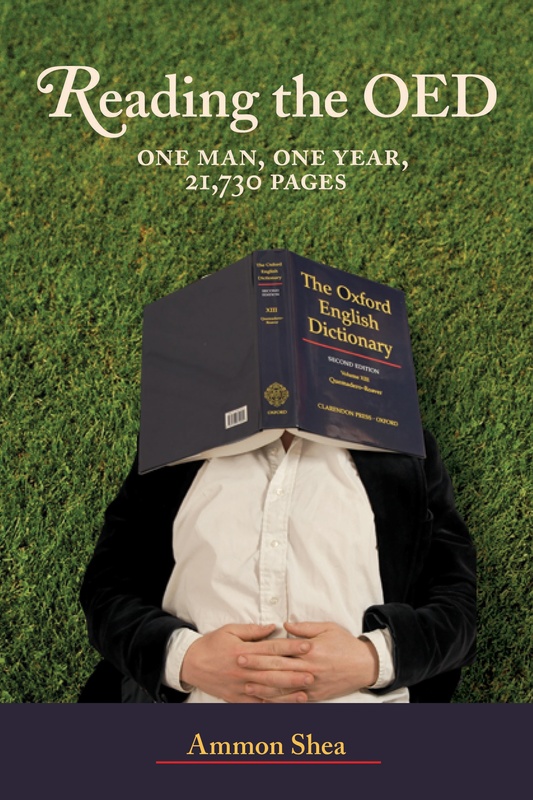 His book, Reading the OED, has been published by Perigee, so go check it out in your local bookstore. In the post below Ammon compiles his favorite words, or at least his favorite words this week. Several months ago, John McGrath of Wordie interviewed me for this blog. He asked me about my favorite words that I had come across in reading the OED and I gave him a list of what they were at the time. But words can be capricious things, and the ones of which I am fondest are constantly changing. And so below is a short list of what are my current favorites. Atechny – (n.) A lack of skill; a lack of knowledge of art. Reading through the dictionary, I am struck, again and again, by the fact that many words to describe common things in life are obscure, and yet the words to describe many obscure things are widely known. For example, everyone knows the word ‘dinosaur’, even though no one has ever seen or met one. Yet, even though we are faced each and every day with artistic ignorance and lack of skill, very few of us know the word atechny. Bowelless – (adj.) Having no bowels; lacking in mercy or compassion. It was certainly news to me that having bowels was once a synonym for having compassion or pity. However, it existed not only with bowelless, meaning “having no pity,” but also in such archaic phrases as bowels of compassion and bowels of mercies. I have decided that this is one of those word mysteries I would rather not delve into. Coenaculous – (adj.) Supper-eating, or, as the OED phrases it: “Supper-loving”. Desiderium – (n.) A yearning, specifically for a thing which one once had, and has no more. Desiderium is the appropriate word for lost youth or innocence, for the great love of your life (who perished from consumption), or for the utopian community that you belonged to that was somehow destroyed by forces of evil. It is not the word for your lost wallet. Exsibilation – (n.) The act of hissing someone off the stage. Whenever I hear or read of the grand old custom of hissing someone off the stage I think to myself, “here is a thing which has been lost to our culture.” In fact I mourn the loss of this far more than I do that of other departed social customs, such as rising from the table when a lady enters or exits, or teaching your child how to make seventeen different knots. This is the sort of knowledge we should be passing on to the next generation – how to hiss someone off the stage. bee, and neuer bargain but when they are drunke”. Ill-willy – (adj.) Cherishing malevolence. Not to be confused with evil-willy (which describes merely the possession of desires that are evil), ill-willy is a state of cherishing malignancy. And although the definition sounds as though it should be applied to some dramatic form of unpleasantness, it’s hard to take any word that ends with –willy too seriously. Occasionet – (n.) A minor occasion. If I manage to make it through an entire day without spilling my coffee on myself it is an occasionet. If I walk into a bookstore after not having visited it for several years and find that the same book that I was thinking about buying the last time I visited is still there it is an occasionet. Life is full of small occasions, and with their variety and small joys they somehow seem to be more worthy of celebration than large ones. Redeless – (adj.) Not knowing what to do in an emergency. Redeless has a variety of meanings, but this is the one that speaks to me the most. In yet another case of the rare thing enjoying a common word and vice versa, it is interesting to note that redeless has largely fallen by the linguistic wayside, while savoir faire (which originally meant “knowing what to do in an emergency”) has survived. Scrouge – (v.) To inconvenience or discomfort a person by pressing again them, or by standing too close. For passengers of modern transportation everywhere, this word has tremendous and unfortunate resonance. It falls firmly within the category of words that one wishes one did not have occasion to use on a daily basis, but are fascinating nonetheless.